You may have noticed that I’m super excited about our citrus trees. Ever since the first oranges and lemons began ripening this winter, I’ve been experimenting with orange-enhanced smoothies, Instagramming overflowing fruit bowls, and hitting up Pinterest for more recipe ideas. 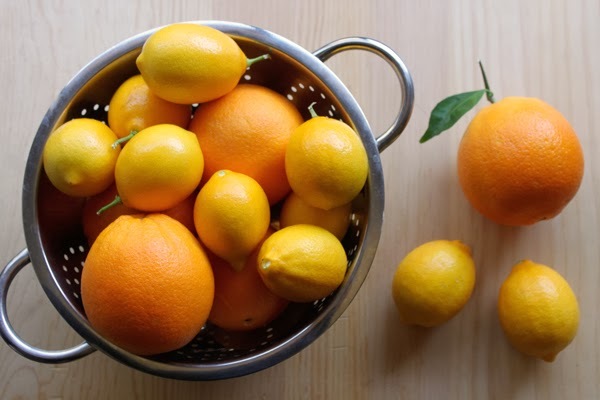 A recipe that caught my eye was preserved lemons from A House in the Hills (I absolutely adore this blog because it’s everything that I love: beautiful meals, clothes, and dogs). I’d never preserved anything before, but it sounded simple enough. The recipe called for thinly sliced lemons, sea salt, a jar, and a week’s worth of patience. 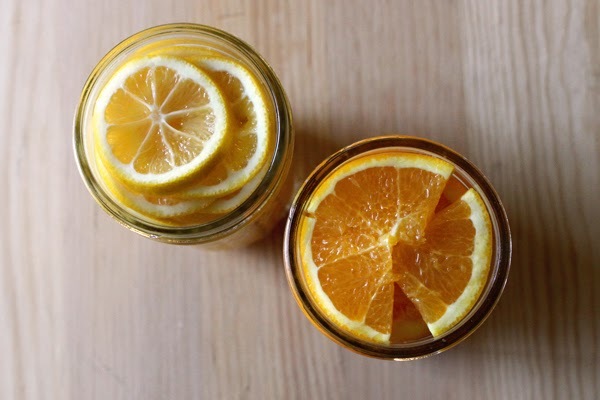 I figured that while I was at it, I might as well give it a whirl with oranges, too. Before beginning my preservation efforts, I also consulted a few other blogs, and they unanimously agreed that you should be generous with the salt. Well, apparently there is such a thing as too generous because a week later, when I opened my jars and bit into my citrus slices, all I could taste was salt. But if at first you don’t succeed, try, try again, right? So the second time around, I was less liberal with the salt. I used two twelve-ounce jars and one-sixteenth a cup of coarse Celtic sea salt between them (here’s the article that introduced me to this kind of salt and made me toss all table types). 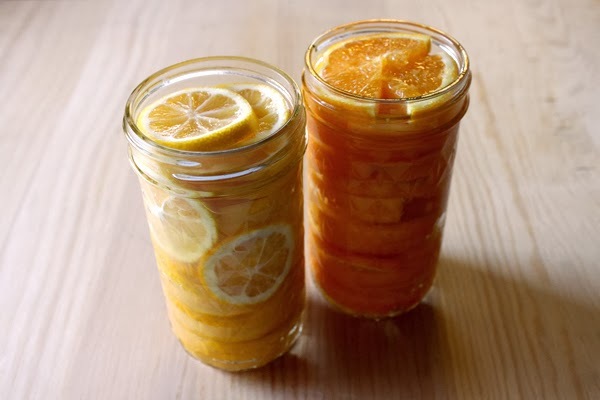 For the jar of lemons, I packed in five Meyer lemons, and for the jar of oranges, two navels. Also, I didn’t slice the oranges quite as thinly as the lemons since I wanted the orange peels a bit chunkier. Overall, it took less than ten minutes. Per the instructions, I let the jars sit in a cool, dark place (aka my pantry) for one week. After a week, the salty-sweet oranges were delicious straight out of the jar. Well, first I rinsed them off and sliced away the pulp, so almost straight from the jar. The lemon peels were edible but a bit too bitter for my liking, but after another week, they were softer, more lemony, and perfectly tart. Another week later, they were even better, with a nice tangy flavor. There are so many ways you can put these preserves to use! I’ve been chopping up the lemon peels and adding them to salads (like this one) for a zesty flavor boost. I’ve been adding the orange peels to salads as well as oatmeal (a new favorite oatmeal combo includes a bit of chopped orange peel, raisins, and vanilla extract). Also, how good does this recipe for grilled salmon with preserved lemons look? 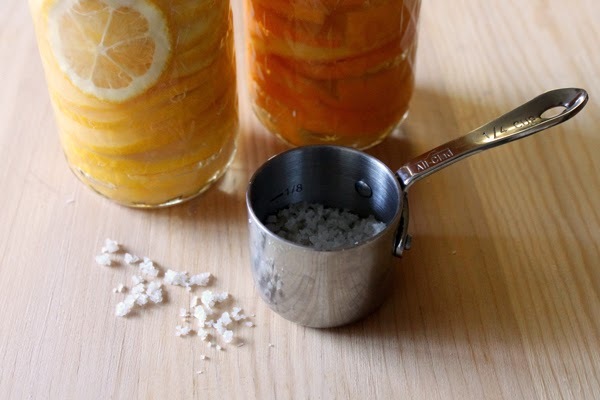 Another perk is that they’re supposed to last “practically forever,” but since I’m almost out of mine already, I’ll definitely be making more batches this citrus season. Here are five more ways to use preserved lemons, including salad dressing and hummus—yum!